Our flagship American IPA is named after Santilli Highway, the street in Everett that the brewery calls home. Pine, Orange Zest, Crisp. Our flagship American IPA is named after Santilli Highway, the street in Everett that the brewery calls home. We first brewed this beer in 2015 under a different name: Morph. That’s right, Santilli originated as a batch of Morph – our rotating IPA series. When we first tasted this one, it became clear that it needed to be more than just a one and done. 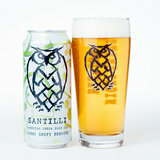 Since that glorious first batch, Santilli has become synonymous with the NSB ethos. Consistent, accessible, and rooted in the spirit of innovation. In 2016, we were honored to take home the Bronze medal in the American-style India pale ale category at the World Beer Cup for Santilli.